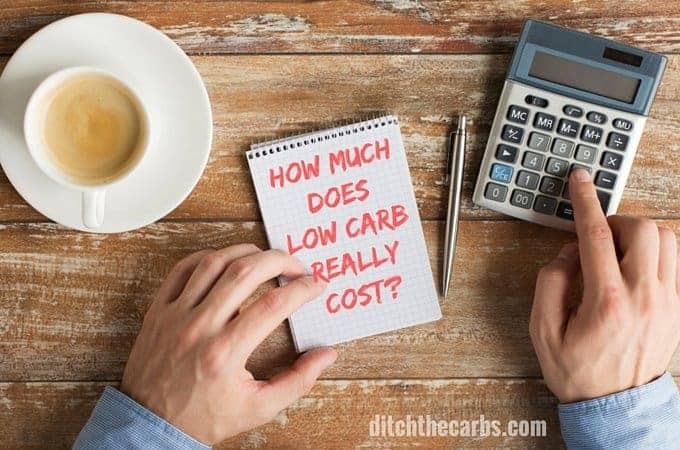 A question I am asked often is “How much does low carb cost?”. 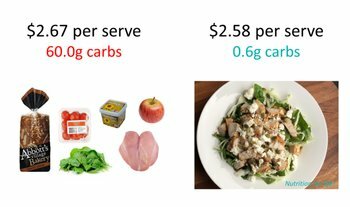 Many perceive changing from a high carb diet to a low carb diet will cost a small fortune. Read on to see why I don’t believe it does and my top tips to help you save money while you transition to low carb. 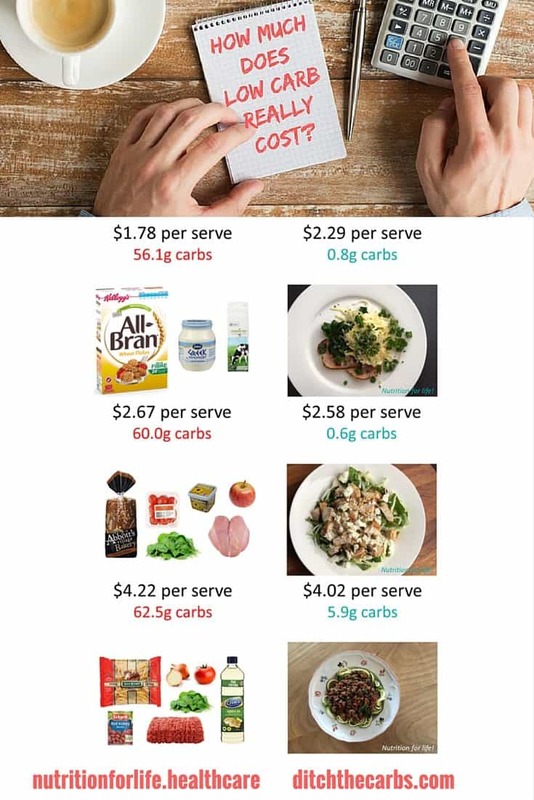 How much does low carb cost can be broken down further into short term costs and long term costs. Short term costs are your immediate expenditure such as your grocery bill whereas long term costs are medical bills, supplements and other lifestyle burdens that you cannot put a price on. There are so many factors beyond money. Health, pleasure, well being, contentment, calmness, weight and longevity to name just a few. Before we question how much does low carb cost, how do you accurately calculate your weekly food budget to begin with? The biggest mistake people make is not to include their snacks, coffees, drinks, meals, vending machines, shared morning teas, that box of biscuits that are sold in the staff room/cafeteria and eating out. When one reader shuddered at how much I spent, we went through her budget and she only calculated what she spent at the grocery store ($100/week) but didn’t accumulate her further $150 on work lunches, drinks, bars, snacks, doughnuts on the way home from work and the chocolate she bought at the petrol station 3 x week. The true cost is every single cent you spend on food and drink each and every week. For me it’s about choice. I can spend $5 buying a coffee, or I can spend $5 on a dozen eggs. I can spend $40 on highly processed protein powder, or I can buy 8 dozen eggs (the best complete source of protein there is). I no longer buy cakes, muffins, crisp and biscuits, I spend that money on ingredients to make nutritious low carb baking instead. I see my food budget as an investment. 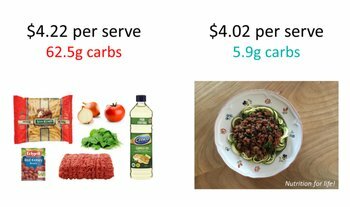 There is a misconception that cooking low cab meals from scratch is more expensive than their old high carb processed diet. Firstly, I would say they are not making an equal comparison. Processed food is not real food. Much of it is cheap fake food. Most of it is made with cheap processed grains to bulk up a meal. Secondly, many believe when you go low carb you have to eat free range, grass fed organic food, but it is simply out of the reach of most. Go for the best you can afford as often as you can. Those people who need the most help will still benefit from swapping their burgers, fries and sodas to regular meat and regular vegetables. 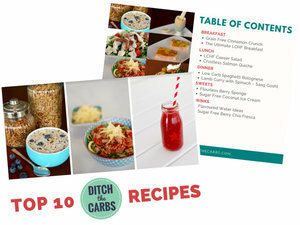 Here are my 100 top tips for saving money when eating low carb. 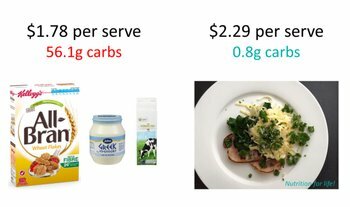 How much does high carb cost vs how much low carb costs. Remember these are the costs of making these lunches at home, if you were to buy the sandwich at a cafe, it would easily be twice the cost. Image credits :: Nutrition For Life who offer a simple and sustainable approach to help you reach your full health potential. Their qualified team includes Accredited Practising Dietitians, Nutrition Consultants and a Credentialled Diabetes Educator. 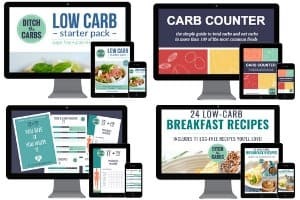 Their approach is based on Lower Carbohydrate and Healthy natural Fat (LCHF) principles, which encourage eating a wide variety of fresh, seasonal and local food, including lots of vegetables and moderate amounts of protein. This approach is scientifically proven to be a better and sustainable way of living. Click here to see the PDF for the full comparison table. There are numerous costs that are a direct result of a high carb diet. Firstly medication, health supplements, hospital and doctors visits. These can run into the thousands. Avoid these future cost now by eating low carb unprocessed real food and you will reduce your risk of heart disease, Type 2 diabetes, obesity, dementia, many cancers and all the complications associated with chronic high blood sugars and an inflammatory diet. Do you want to be able to tie your own show laces at 80 or have someone do it for you? We need to eat real food now, because chronic health conditions don’t happen overnight. What we eat today, will directly influence out future. Share this on Pinterest, Facebook and Twitter (hover for easy sharing buttons). I’ve found making healthier choices is pricey. Sausages without the fillers are $16kg, where as rice filled gluten free snags are $7kg. I buy nitrite free bacon $25kg, but from the supermarket (with nitrites) is $10kg. Fortunately cheaper cuts of meat go well in the slow cooker, and buying seasonal veggies helps too. But overall I’ve found I spend more – food with less rubbish ingredients costs more than that without cheap fillers. So true, but indeed we need to realise the sausages that are packed with fillers, only contains a small percentage of real food or meat in them, so if we calculated the amount of meat in each sausage, they are probably the same meat kg/$. My 9 year old boy would easily eat 4 of the cheaper sausages with fillers but since changing to pure meat sausages, he can only manage 2 sausages. I now buy less meat but of a good quality. I’ve also found that cheaper chicken breast shrink so much on cooking. Low carb has certainly proven cheaper for me in the long term. Yes some of the oils can be pricey and I only buy Kerrygold butter which is one of the most expensive buttes in the Uk. Almond and coconut flours are expensive too. Also buying new clothes was a short term cost but I bought from charity shops as much as possible to keep those costs down. I now rarely feel hungry and am able to get by on one meal a day. I’m essentially on 23/1 intermittent fasting. So my food bill overall has dropped considerably. Also my car now carries 77lbs less so there’s a fuel saving there! Another saving has been with my dentist. At my last check up I was told I didn’t need to be seen again for another year rather than in the usual six months. One thing that isn’t mentioned much in the low carb community is that a hflc diet is good for your teeth. But mister, there is also something called time cost. Not just money, but time(for preparation) also. And how much time does it take to visit doctors, pharmacies, physiotherapists etc … We must invest in ourselves, time and money. With everything in life, it comes down to priorities. I have so many recipes that are super quick and easy. Slow cooker meals, using leftovers, batch cooking … in fact, the simpler cooking is, the more sustainable it is. I am a very busy mum with a family of 5. My mantra here is Real Food, Real Easy. Since going low carb my weight is remarkably stable. 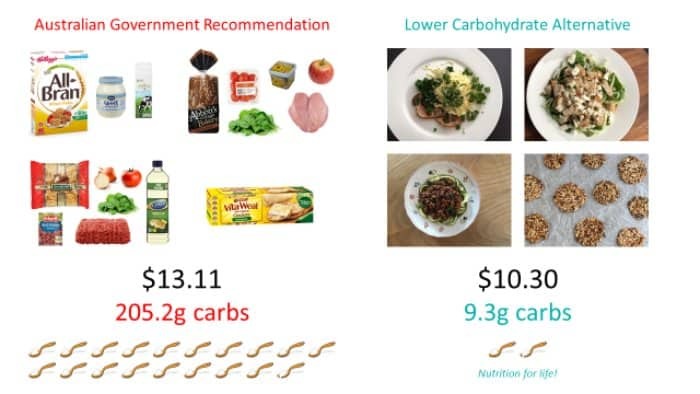 I figure that if continuing a high carb diet, by now I would have put on considerable weight and would be consuming considerably more calories each day, which would add to my food cost. Actually, since I’m in LCHF style, I don’t need to snack at all. Also I only have a cup of dark tea with some cream for breakfast. Mmm… I din’t check it but with only two complete, nutritious and delitious meals a day perhaps I’m saving money! I love this article. You did a great job with the cost/meal comparisons! It’s great that you debunked the misconception that going low carb, or making healthier eating choices is more expensive — it really is pretty much the same (the only that gets pricey for me is when I have to stock up on my spices!) — I went low carb almost a year ago, and what I spend at the grocery store is what it is. Sure, I could get ramen of cup of noodle for $5 for the whole week, but ehhh. The only big difference in price I’ve ever seen is when I buy organic, which I am slowly doing, when I can. Its a huge misconception that eating cooked meals vs processed/ready-to-go meals is more expensive. But, the satisfaction and “fullness” your belly gets from eating the right foods I believe makes you eat less often.